For the past five springs, the Western Canada Cup (WCC) has brought together the top teams from Junior A hockey in Western Canada. The BCHL, AJHL, SJHL and MJHL all sent their champions, who joined the host team, in hopes of making the finals and earning one of two spots in the Royal Bank Cup. However, after the WCC didn’t live up to expectations, the leagues are going back to their previous format. Kim Davis, the commissioner for the Manitoba Junior Hockey League (MJHL), spoke about the Western Canada Cup and its end. “One of the reasons we engaged in that revised format to the WCC was because we hoped and had an idea that it might be able to make it a big event that got a lot of attention, both in the media and minds of supporters in Junior A hockey. It didn’t get that. We tried it over five years and we didn’t see that was going to happen. Certainly, the financial performance of each of the events was not what we expected either,” Davis said. 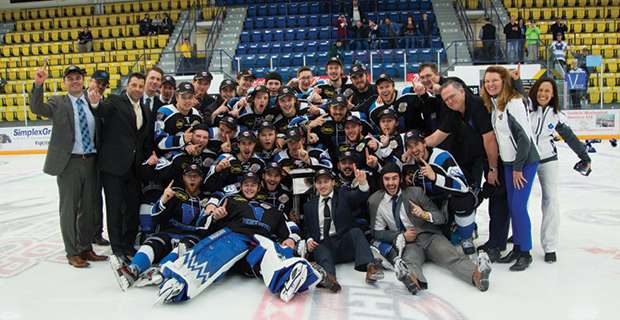 After Penticton hosted last year, rumblings came up it was the end, and after agreeing to go back to the initial series to get to the RBC Cup, the leagues quietly reverted back. So, the Western Canada Cup is gone and entering its spot are the Doyle Cup and ANAVET Cup, both rich with history. The Doyle Cup was the Pacific Centennial Cup from 1971-1984, before becoming the Doyle Cup. Meanwhile the ANAVET Cup, representing the Army, Navy and Air Force, has been around since 1971 as well. Out west, BC and Alberta will send their victors into a best-of-seven series for the Doyle Cup. Travel may still be abundant, especially if you pick the furthest teams from each league, Fort McMurray and Powell River, a long 20-hour drive away. Even the top seeds in each league, Okotoks and Penticton, are eight and half hours away. The ANAVET Cup will pit Manitoba against Saskatchewan, and they’ll see slightly less travel. The matchup that presents the greatest distance is Steinbach and Battlefords, with approximately 10 hours of road between them. It gives a fair chance for all teams to get a spot in the RBC Cup. On the other side, BC and Alberta are generally regarded as the top Junior A Leagues in the nation, so not having a team from both is a tough pill to swallow. This year, BC is aiming to have two, as the Chilliwack Chiefs are the RBC Cup host. They’ll have nearly two months off, after losing in the first round of the BCHL playoffs, giving them plenty of rest. In the WCC’s half-decade of existence, teams from BC have lifted the hardware three times, with Alberta and Saskatchewan each earning a victor. The runner-ups have included two from Alberta, two from Manitoba and BC getting the third. Each league boasts an impressive crop of teams who make a good case as to why they should be in Chilliwack. In Manitoba, the Steinbach Pistons went 48-8-2-2 for 100 points, 17 above the next closest team. The third-ranked team in the CJHL rankings could be threatened by the Virden Oil Capitals, the second-highest scoring team in the MJHL. Nipawin earned the regular season crown in Saskatchewan with their 43-8-3-4 record, but 2017 champs from Battlefords and the 2015 and 2016 winner, Melfort, had strong seasons as well. Battlefords’ Layne Young put up the highest-scoring season in the past seven seasons of the league and is a game-breaking talent. The CJHL’s No. 1 ranked team Okotoks lead the AJHL with an outstanding 56-6-2 mark, including a 24-game win streak to end the year. They’ll likely have to get by the Brooks Bandits, who have represented the South in the finals five of the past six seasons, have four championships in six years, and were second place in the South in the regular season. Up North, Spruce Grove has four league titles and seven finals appearances since 2009 and were the second best team in the regular season. In BC, Penticton and Vernon battled to the end as they always seem to do, but the Vees finished three points up on the Vipers to give Penticton home series advantage through the postseason. The BCHL playoffs have been very unpredictable, however. According to Davis of the MJHL, the ANAVET will start with home ice advantage for his league, because in 2012 when it was last contested, Saskatchewan played host. Since there can be considerable travel – upwards of 10 hours between the furthest playoff teams for each, the series with be two games in Manitoba, three in Saskatchewan, and the final two, if it goes beyond four games, back in Manitoba. The BCHL and AJHL are more spread out and have mountains and oceans getting in the way of their teams. There’s a chance travel between the Doyle Cup finalists could be around 20 hours if Fort McMurray and Victoria won their leagues, but even with closer teams, the drive will be considerable. It looks as though the BCHL will have home ice advantage this time around. Getting to the RBC Cup doesn’t get any easier with the WCC gone, as the number of games is still comparable. It’ll just allow for local fans to see more of their teams, and for familiarity among players to build a strong rivalry for the seven game series.